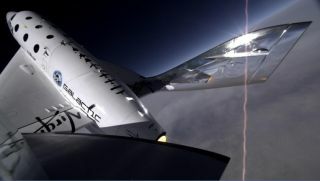 The twin tail booms on Virgin Galactic's first SpaceShipTwo are seen swiveling into their feathered position in this image from a tail-mounted camera taken just before the spacecraft broke apart, killing the co-pilot and injuring the pilot, during an Oct. 31, 2014 test flight. NTSB investigators say co-pilot error was to blame. The fatal breakup and crash of Virgin Galactic's first SpaceShipTwo space plane last year was caused by a co-pilot error, as well as the failure of the spacecraft's builders to anticipate such a catastrophic mistake, federal safety investigators say. SpaceShipTwo crashed in October when co-pilot Michael Alsbury unlocked the commercial space plane's re-entry "feathering" system too early during a test flight over California's Mojave Desert, investigators with the National Transportation Safety Board said in a hearing today (July 28). National Transportation Safety Board chairman Christopher Hart asks questions into the Virgin Galactic SpaceShipTwo crash of Oct. 31, 2015 during a hearing on July 28, 2015. Co-pilot error was cited as the probable cause. "It is our hope that, through this investigation, we will find ways to prevent such an accident from happening again," Hart said during the hearing. An NTSB investigation revealed that the SpaceShipTwo crash in 2014 was due to pilot error..
Virgin Galactic's SpaceShipTwo is a spacecraft designed to launch two pilots and six paying passengers on suborbital rides into space for a cost of $250,000 per passenger. On Oct. 31, 2014, the first SpaceShipTwo broke apart during its fourth rocket-powered test flight over the Mojave Desert in California, with debris from the spacecraft strewn across a 5-mile (8 kilometers) track near Koehn Lake. Alsbury, a veteran test pilot who had flown on SpaceShipTwo before, was killed in theaccident. Pilot Peter Siebold suffered serious injuries but survived when his seat was ejected from the spacecraft as it broke apart, allowing him to use a parachute. NTSB investigators said the accident occurred when Alsbury unlocked SpaceShipTwo's novel tail-boom "feather" system too early, while the craft was flying at Mach 0.8 and not at Mach 1.4 as the original flight plan required. (Mach 1.0 is the speed of sound.) You can see SpaceShipTwo's tails swing up unexpectedly in this video released by the NTSB. The feathering system must be unlocked before SpaceShipTwo reaches a speed of Mach 1.8, or else the flight would have had to abort, NTSB officials said. SpaceShipTwo's novel feather system rotates the craft's twin tail booms upward to help stabilize the craft during its re-entry into Earth's atmosphere at the end of a flight. During the boost phase, when the rocket motor is firing, it is locked into position to secure the tail booms during flight. When Alsbury unlocked the feathering system early, turbulence from SpaceShipTwo's transonic flight overpowered the tail booms' securing mechanism, leading to the vehicle's destruction, NTSB investigators said. The NTSB reviewed a "mountain of data" from the accident, including telemetry from SpaceShipTwo and video recorded both inside and outside the craft, before reaching its conclusion. NTSB board member Robert Sumwalt questioned why Scaled would not stress — through better training and safety precautions — the importance of unlocking the feather system on time. "I don't mean this flippantly, because I've made plenty of mistakes, but humans will screw up anything if you give them enough opportunity," Sumwalt said. "And I don't mean that with any disrespect to the crew. The fact is, a mistake was made here, but the mistake is often a symptom of a flawed system." NTSB investigators acknowledged that, in the nine months since the SpaceShipTwo accident, Scaled engineers and Virgin Galactic have developed an inhibitor that would prevent the feather system from being unlocked early. Virgin Galactic founder Sir Richard Branson confirmed that fix in a video responding to the NTSB's SpaceShipTwo accident hearing, and he thanked the NTSB for an investigation that will "help make the fledgling commercial space industry safer and better." In a statement after the NTSB hearing, Scaled Composites representatives stressed that safety is a critical component of the company's culture, and that its pilots are experienced and well-trained. "As part of our constant and continuing efforts to enhance our processes, we have already made changes in the wake of the accident to further enhance safety. We will continue to look for additional ways to do so," Scaled representatives said in the statement. "We extensively supported the NTSB's investigation and appreciate all of its work to make the industry safer. Mike Alsbury exemplified the passion that all our employees share. He and his family are always in our thoughts, and they are especially so today." NTSB investigators also took a close look at the oversight of Scaled Composites and Virgin Galactic by the Federal Aviation Administration's Office of Commercial Space Transportation (AST) in the years leading up to the accident. NTSB investigator David Lawrence said that, while Scaled Composites was open and cooperative with questions from FAA AST regulators, some of those questions were actually filtered out by AST management and never reached Scaled. In 2013, the FAA gave Scaled a waiver excusing the company from some human- and software-error requirements, even though Scaled never asked for such treatment, investigators added. The NTSB ultimately drew up a set of 10 recommendations, eight of them aimed at the FAA AST, to increase safety and reviews. The other two were for the Commercial Spaceflight Federation to serve as a safety proxy for the growing private spaceflight industry. "The big picture: Commercial spaceflight stands on the verge of becoming a reality," Hart said. "But the success of commercial space travel depends on the safety of commercial space travel, at the level of every operator and every crew." Branson also stressed Virgin Galactic's resolve to forge ahead and learn from the SpaceShipTwo crash. "Every new transformative technology requires risk, and we have seen the tragic and brave sacrifice of Mike and the recovery of injured surviving pilot Pete Siebold," Branson said. "Their tremendous efforts are not in vain and will serve to strengthen our resolve to make big dreams come true." Editor's note: This story was updated at 9 p.m. Et to include a statement from Scaled Composites received after publication.